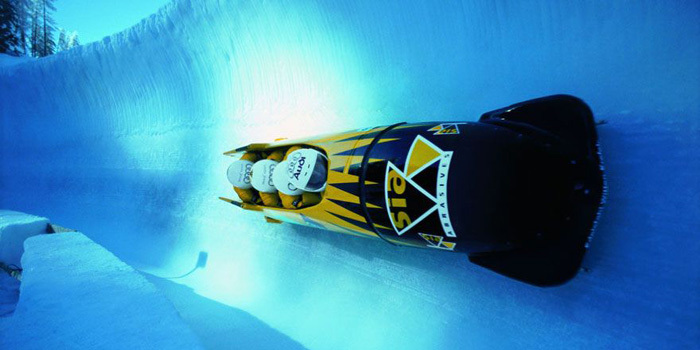 BOBSLEIGH or bobsled is a winter sport in which teams of two or four people make timed runs down narrow, twisting, banked, iced tracks in a gravity-powered sled. The timed runs are combined to calculate the final score. The various types of sleds came several years before the first tracks were built in St. Moritz, Switzerland, where the original bobsleds were adapted upsized luge/skeleton sleds designed by the adventurously wealthy to carry passengers. All three types were adapted from boys' delivery sleds and toboggans. A TOBOGGAN is a simple sled which is a traditional form of transport used by the Innu and Cree of northern Canada. In modern times, it is used on snow to carry one or more people (often children) down a hill or other slope for recreation. Designs vary from simple, traditional models to modern engineered composites. A toboggan differs from most sleds or sleighs in that it has no runners or skis (or only low ones) on the underside. The bottom of a toboggan rides directly on the snow. Some parks include designated toboggan hills where ordinary sleds are not allowed and which may include toboggan runs similar to bobsleigh courses. List of Bobsleigh World Cup champions - Wikipedia. ST. MORITZ BOBSLEIGH CLUB - since 1904. ST. MORITZ Tobogganing CLUB - since 1884. THE PHYSICS OF BLAZING FAST BOBSLED RUNS - Wired. Bobsleigh at the Winter Olympics - Wikipedia. CRESTA RUN - since 1884 at St. Moritz. Most important races: Curzon Cup, Morgan Cup, Brabazon Trophy, Grand National. List of bobsleigh, luge, and skeleton tracks - Wikipedia. OLYMPIA BOB RUN - since 1904. This makes the ice track in the Upper Engadin the oldest bob run and also the last remaining natural ice bob run in the world. St. Moritz, Switzerland.